Finding Oregon Agates is all about exploring the right beaches! Hunting for agates on the beautiful beaches of Oregon is a thrilling activity for both adults and children. The coastal regions around Oregon are some of the best places to find agates in the United States. 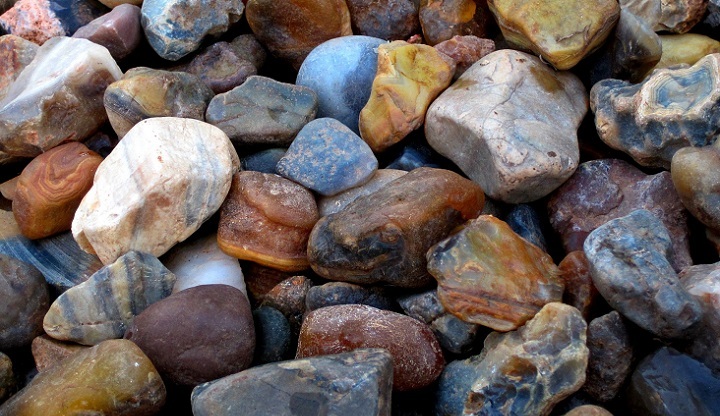 Unlike other gemstones stones such as emeralds and rubies, agates often wash up on beaches where beachcombers can find and pick them up. Agates are quarts like materials formed in hollow volcanic rocks that often outlast the rock and are exposed to be picked by rock hunters. Agates are quite attractive and although they do not have much monetary value they are still very beautiful and lots of fun to collect. Depoe Bay is located along the Pacific Ocean and has a great coastline where agates are commonly washed up on the beach. Depoe Bay is a relatively small town but grows considerably during the summer when tourism picks up. But, beyond the busy harbor, there are stretches of ocean front beaches that offer beachcombers a realistic chance of collecting high-quality agates. In fact, agates can be found anywhere on beaches in this area from Newport in the south all the way to Lincoln city in the north. Beverly Beach is a beautiful agate bearing beach in Lincoln County, Oregon. The beach is located between Beverly Beach State Park and the Yaquina Head. The beach was first name in the 1930s and today it boasts of a small friendly community. The beach is surrounded by creeks and cliffs that are known to contain fossils and gemstones that are often washed into the ocean and then back to the beach. Agates and other minerals found in this area are believed to come from the surrounding cliffs which when they are broken down by winter storms, these gemstones are washed down the creeks and then they are deposited on the beach down by the ocean. Collecting Oregon agates is a great pass time for many visitors to the beach. In addition, one could go for hiking and sightseeing in the nearby Beverly Beach State Park. For those visitors that want to spend a night near this beautiful beach, the park is the perfect place for camping. Moolack Beach is another great agate beach between Lincoln city and Newport in the central region of the Oregon Coast. The beach stretches for 5 miles from Otter Rock in the North to Yaquina Head in the south. The beach is located close to the Devils Punch Bowl State Natural Area which makes it a must visit not only for the agates but for the beauty of the beach too. Moolack Beach is a great site for agate and fossil hunting in addition to the popular surfing. The beach is usually uncrowded throughout the year and has a flat surface that is ideal for agate hunting. Although agates can be found all around the beach, the best place to start your hunting is the area around the creek flowing south of the beach. Most of the agates around this area are washed from the agate rich volcanic rocks upstream. After collecting agates, visitors may want to visit Otter Rock for whale watching or the Yaquina Head lighthouse which is the tallest lighthouse in Oregon. And: Rockhounding in Washington – Jade, Agates, Quartz and More! This is a beautiful town at the foot of the enchanting coastal ranges along the pacific in Lincoln County. The town got its name from a Chinook Indian word for dark water. The town is surrounded by beautiful beaches, lighthouses, creeks, and streams most of which bear agates. The volcanic mountains surrounding Yachats are considered to be the source of the Oregon agates in this area. The Siuslaw National Forest which is dotted with streams and creeks such as Rock creek and Cummins Creek are all known to contain agates. There are also a number of state recreational facilities such as the Yachats Ocean Road State Natural Sites, the Yachats State Recreation Area, Smelt Sands State Recreation Site and the Yachats Community Park among others that contain camping spaces and offer information on where to find agates around this beautiful town. 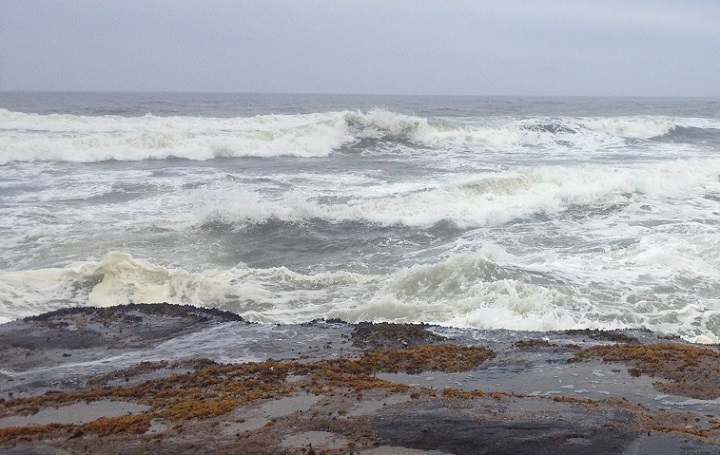 Yachats, Oregon is a great place to search for agates. Oceanside is a beautiful small town located in Tillamook County. 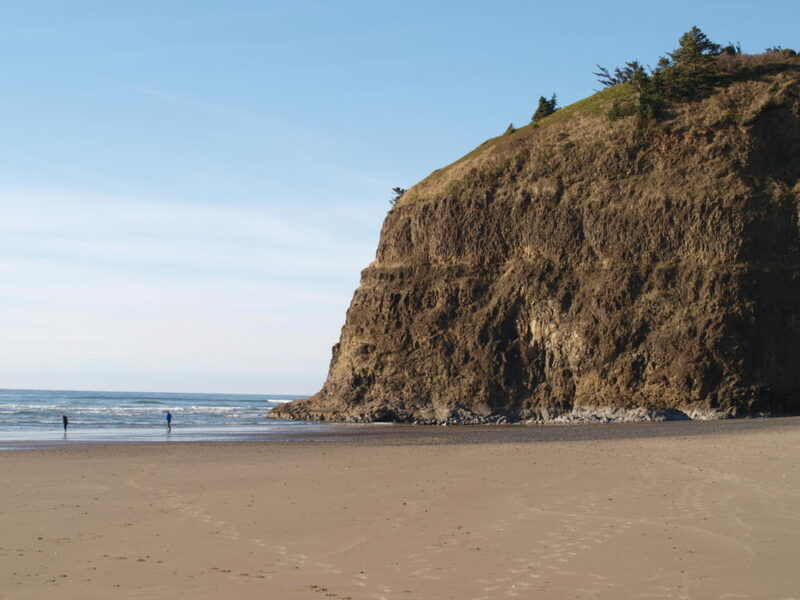 The town is home to beautiful beaches that are also known to have some very nice Oregon agates. In addition to the beaches, the town is also home to the Three Arch Rocks National Wildlife Refuge, the Oceanside Beach State Recreational Site and Symons State Park. The Oceanside Beach is a favorite agate hunting spot for many visitors to this small community. The agate here comes from the creeks that wash them into the ocean before they are washed back onto the beach. If you apply yourself to agate hunting you can leave this beach with a sizable amount of agate treasures. For most people, the fall and winter are the perfect seasons for agate hunting on the beaches here. The winter storms are thought to be responsible for washing a high number of agates to the beach. Two beachcombers explore the gravels at Oceanside in search of hidden treasures. This is a popular beach for agate hunting, especially after a winter storm. Gold Beach is located near the point where the Pacific Ocean meets the Rogue River. The beach is made up of friendly communities and stretches for miles, providing ample space for agate hunting. The Rogue River carries agates from volcanic rocks upstream and deposits them in the Pacific Ocean before they are washed onto the beach. This makes this beach an important agate hunting area as the agate stock on the beach is constantly replenished by the river. The Oregon Coast is known for its beautiful agate and is thus an important coastline for beachcombers. The best places to find the agates along the coastline are on the edges of cliffs, and along creeks on the beach. The winter is generally considered the best time to hunt for agates along the coastline although people still find agates all throughout the year. Any time after a large storm is generally a good time to go out and do some beachcombing, as the turbulent water will was agates up on the beaches. Agates aren’t the only thing to search for along the Oregon Coast. You can occasionally find other minerals and fossils in the beach sands as well, and of course there are a wide variety of seashells that you can collect.